Cassie Hack has been through her fair share of trials and tribulations. One of these pitted her against "The Lunch Lady," who also just so happened to be Cassie's mom. After that, she committed her life to hunting down killers and supernatural evil. She thought she left that life behind, but in Hack/Slash: Son of Sahmain, written by Michael Moreci and Steve Seely and illustrated by Emilio Laiso, she’s drawn back into the slasher-fighting life when a cult of monsters plot to unleash an ancient evil on the world. With the help of a new partner, Cassie must confront a darkness like she’s never encountered before — and the darkness in her own life. Hack/Slash: Son of Sahmain Volume 1 will be in comic book stores on January 14 (Diamond Comic order code NOV140608) and in bookstores on January 27 (ISBN 978-1-63215-244-2). It is available for pre-order now. After Cassie Hack was the lone survivor of the killing spree of a slasher nicknamed “The Lunch Lady” — who was also Cassie’s mother — she committed her life to hunting down killers and supernatural evil. 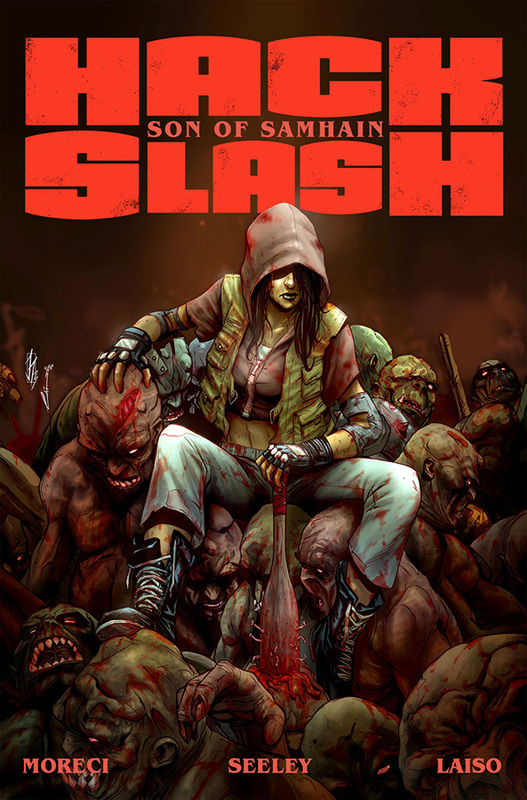 She thought she left that life behind, but in HACK/SLASH: SON OF SAMHAIN, she’s drawn back into the slasher-fighting life when a cult of monsters plot to unleash an ancient evil on the world. With the help of a new partner, Cassie must confront a darkness like she’s never encountered before — and the darkness in her own life. HACK/SLASH: SON OF SAMHAIN Volume 1 will be in comic book stores on January 14 and in bookstores on January 27. It is available for pre-order now.